I should really title this “The Best Thing I’m Probably Gonna Eat All Year.” Top this, 2015! Over our New Year’s holiday, Shake and I ate at Hilo’s Moon and Turtle restaurant (formerly known as Full Moon Café) twice, once for dinner and once for lunch. On our lunch visit, we were fortunate enough to be sitting at the bar counter enjoying Bloody Marys made by co-owner Soni Pomaski just as Chef Mark Pomaski’s seafood delivery arrived. In the box: beautiful, fresh ama ebi (literally “sweet shrimp” in Japanese, aka spot prawns) from Kaua‘i. Mark served us a dish of lightly grilled ama ebi (it would be a dinner special dish that night) and then followed that up with a plate of ama ebi ceviche, seen above, delicately flavored with celery, garlic and citrus, topped with the deep-fried ama ebi heads. The crunchy heads were delicious (you can eat the whole thing, shell, legs and all) and a nice contrast to the melt-in-your-mouth prawns. 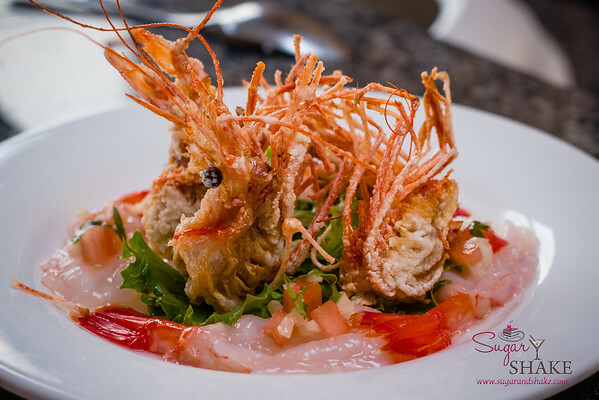 Unlike the regular prawns or shrimp you normally tend to see, ama ebi are already pink when uncooked and taste amazing raw. They are not available all the time, and when they are, the quantities are limited. Moon and Turtle has been offering them frequently of late, so I highly recommend you stop in and get some while you can! Our Moon and Turtle lunch was incredible—I have a hard time envisioning another meal that will top this this year, even though it’s only just begun! I’ll post more about Moon and Turtle soon, once I’ve gotten through all the Hilo trip photos. PS: I just started an Instagram account under the Sugar + Shake name (@sugarandshake)—yeah, yeah, late to the party, blah, blah—so if you’d like to keep up with what we’re eating, drinking and cooking, follow along.